A Chinese bullet train lost power after being struck by lightning and was hit from behind by another train, sending four carriages off a bridge, killing at least 39 people and injuring 191, state media reported. The official Xinhua News Agency said four cars on the second train plunged about 20 to 30 metres off the bridge. 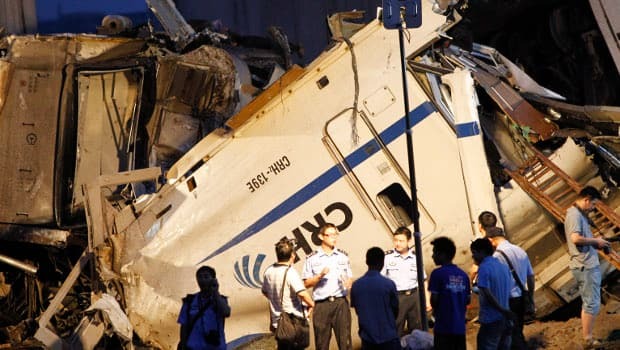 The first train was travelling from the Zhejiang provincial capital of Hangzhou when the accident occurred in Wenzhou city at about 8:30 p.m. local time, Xinhua said. Pictures on the Internet showed one badly damaged car lying on its side by the bridge and the second car leaning against the bridge after landing on its end. Xinhua quoted an unidentified witness as saying "rescuers have dragged many passengers out of the coach that fell on the ground." The trains involved are "D" trains, the first generation bullet train with an average speed of about 150 kilometres per hour and not as fast as the new Beijing-Shanghai line. Xinhua said the train hit by lightning was "D3115." It said the Ministry of Railways confirmed that it was hit from behind by train "D301." Recently, power outages and other malfunctions have plagued the showcase high-speed line between Beijing and Shanghai since it opened on June 30. Official plans call for China's bullet train network to expand to 13,000 kilometres of track this year and 16,000 kilometres by 2020.